The Scottish Event Campus (SEC) is the largest exhibition centre in Scotland. It is located in the district of Finnieston on the north bank of the River Clyde. The SEC is host to over 50 events each year and is home to some of the UK’s largest and most successful events. This venue is ideally located close to Glasgow’s city centre and easily accessible through the city’s well-connected train system. The original complex was built in 1985 and has been expanded two times. Now, the Scottish Event Campus consists of three main buildings: SEC Centre (original complex), SEC Armadillo and the SSE Hydro. Glasgow is the most populated city in Scotland and the third biggest city in the United Kingdom. The city is situated on the River Clyde in Scotland’s West Central Lowlands and visitors will receive a very warm welcome as the city of Glasgow was named as the world’s friendliest city. 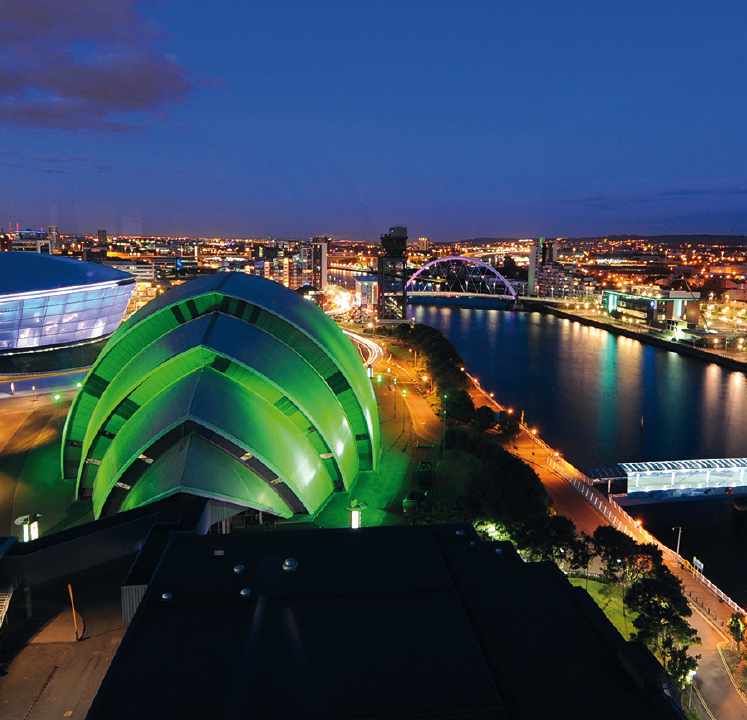 Glasgow is a city full of world-class attractions, marvellous architecture, great food and rich in culture. From a small settlement on the River Clyde and an industrial city, Glasgow became a grand cultural hub and popular destination, which offers amazing events and festivals year-round as a UNESCO City of Music. The official currency of the United Kingdom is the Pound Sterling (GBP - £). The United Kingdom is on Greenwich Mean Time (GMT). From April to October, the UK observes daylight saving time (or BST – British Summer Time): GMT + 1 hour. The United Kingdom uses a 230V/50Hz system. The power sockets are of type G sockets: three rectangular pins and it is grounde.